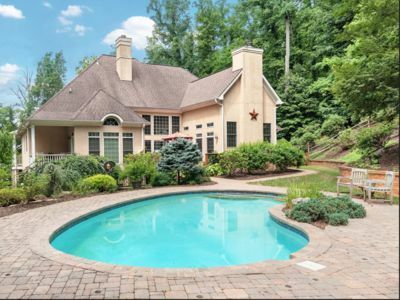 Private Cabin With Swimming Pool, Covered Deck for Entertaining! Pet Friendly! 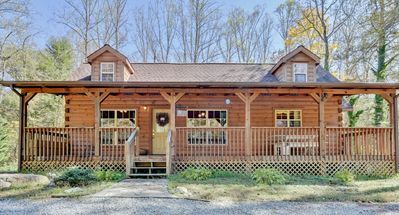 This cabin is an entertainers paradise! 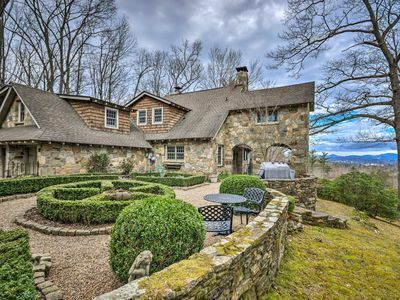 Tucked away atop a mountain, then down into a private valley setting in apple country, the "Cliffhanger" in the woods is a true gem! 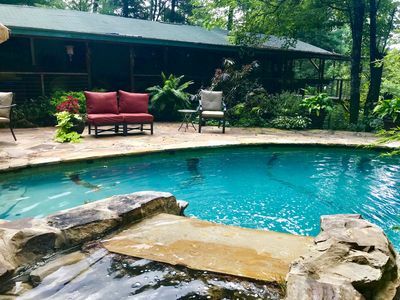 Take a swim in your outdoor pool with a genuine gemstone feature and night changing LED lights, pond, waterfall and landscaped garden with native plants and art. 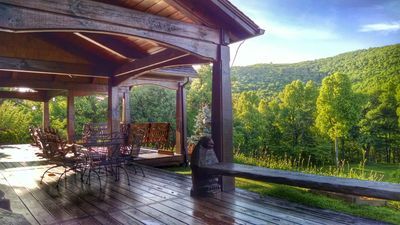 Huge wrap around covered porch and large deck to enjoy outdoor living most of the year with the exception of winter months. 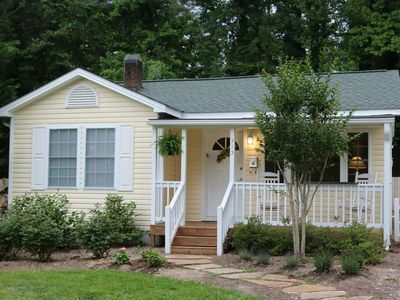 Fully equipped kitchen, gas stove and stainless appliances. 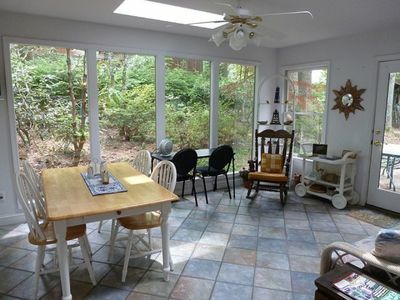 Two large bedrooms with two full baths. Relax in the jacuzzi bathtub with jets just off the master bedroom. Exotic wood floors throughout the cabin and custom made wood doors. 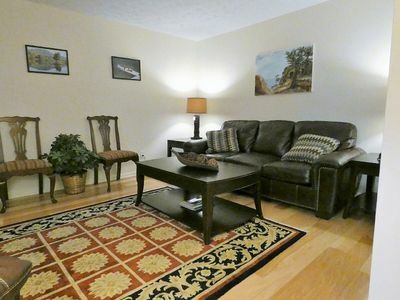 Large comfortable great room with cozy furniture to relax after a long day exploring. Walk to the community chapel and attend Sunday morning services during summer season. 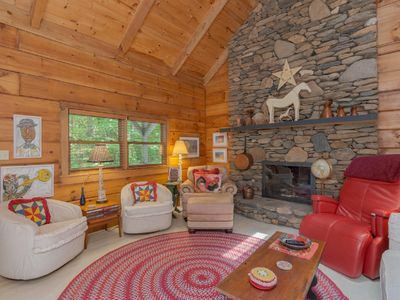 Take a refreshing morning swim, or open your windows and enjoy a peaceful sleep and mountain fresh air, or sit by the gas fireplace with a good book. 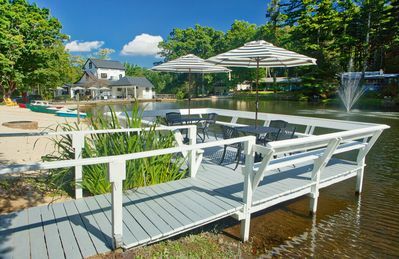 The Cliffhanger offers endless family fun and enjoyment along with quiet hours of just pure relaxation! 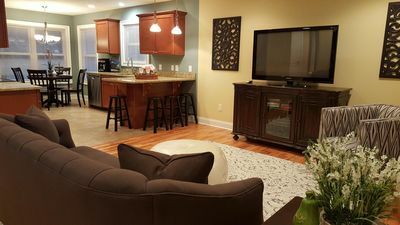 We have provided Netflix, Direct TV and wifi calling for our guests. Cell reception may be spotty depending on your carrier (you may want to turn wifi calling on with your cellular carrier. There is also hi-speed Wi-Fi throughout the cabin. Winter in the Blue Ridge Mountains of North Carolina not only has its own special beauty, but also offers a whole lot of fun! 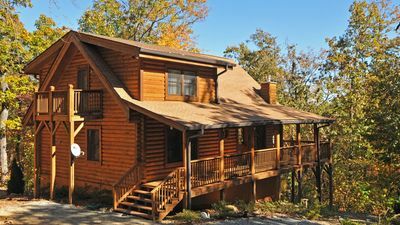 Make plans this winter to visit the ski mountains of Western North Carolina. No other state in the region can boast so many slopes and opportunities to have fun in the snow all winter long! 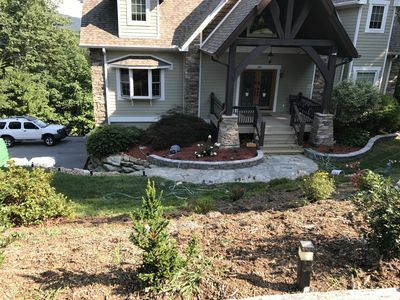 Six ski resorts all within an hour to 2 hours away: Cataloochee Ski Area, Ski Sapphire, Wolf Ridge Ski Resort, Sugar Mountain, Beech Mountain and Appalachian Ski Mountain. 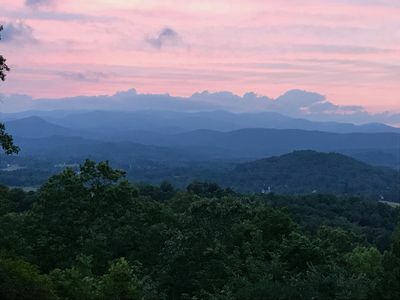 On your drive to the Cliffhanger, you will experience 'Apple Country' as Henderson County is the largest apple-producing county in North Carolina and grows 65 percent of the apples in the state. Today Henderson County and Edneyville is home to approximately 200 apple growers. There are about 5000 acres of apple trees planted in Henderson County. The apple harvest season runs from late August to late October. 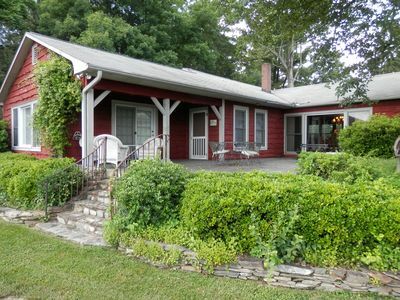 For wine enthusiasts, the Cliffhanger is located just minutes from two local 'family owned' wineries. Saint Paul Mountain Vineyards and Burntshirt Vineyards, both family-owned with tasting rooms and wine available for purchase. 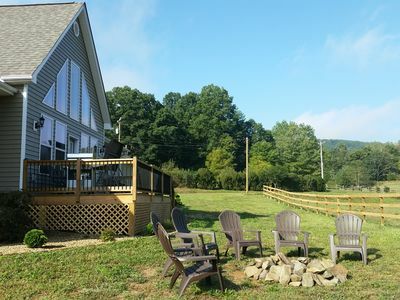 Both wineries enjoy panoramic views of the Blue Ridge Mountains. Sample the many varieties from wine grapevines, grown on the vineyards at elevations of 2,300 and 3,000 feet along with cool nights produce some of the best wine producing grapes in the country! 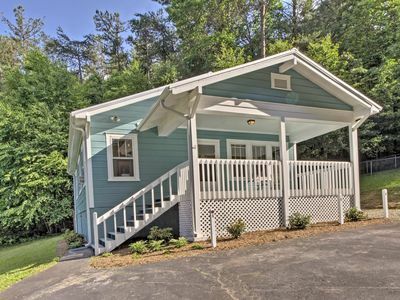 During your stay at the Cliffhanger, you will want to take 15 - 20 minute drive to Lake Lure. The lake is approximately 720 acres, with about twenty-one miles of shoreline. National Geographic has called Lake Lure one of the most beautiful man-made lakes in the world! Lake Lure sits in the heart of Hickory Nut Gorge and its picturesque setting offers numerous photo opportunities. East of Asheville, the crystal clear Rocky Broad River tears its way in a series of rapids down through Hickory Nut Gap. 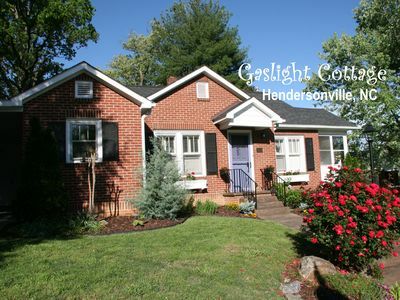 Historic downtown Hendersonville is just a twenty minute drive from the Cliffhanger. 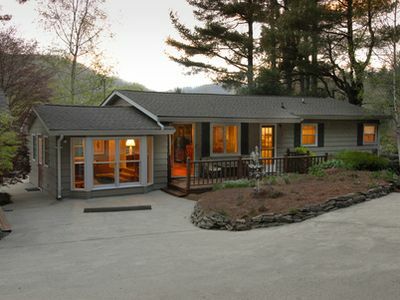 Hendersonville is located 22 miles south of Asheville, NC on a plateau with an altitude of 2200 feet above sea level. 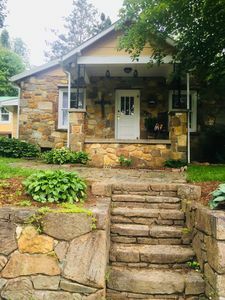 Explore the town and surrounding country with varied attractions, festivals, recreational activities, historical sites, golf courses, family activities, historic districts, a variety of accommodations and restaurants. 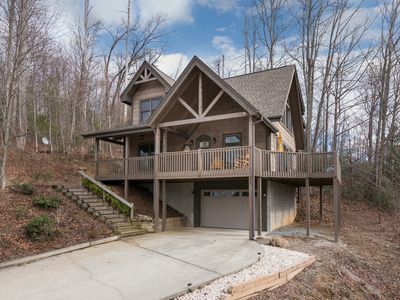 Newly Constructed Mountain Home with Wonderful Views, yet Close to Town!